For the first time ever, a Chinese surgical team used 3D printing to complete a major operation on a 9-month-old baby. Much of the time during major surgeries, surgical teams have to go in blind. While a diagnosis may be on hand, the actual problem that they have to fix will only be revealed once the patient has been cut open and is lying on the operating table in all their wet, unconcealed glory. For instance, you can’t expect doctors to open a patient’s chest twice for, say, open heart surgery, just to check out what exactly it is they have to operate on. This makes 3D-printed replicas of organs a very valuable tool for surgeons. Not only are they able to visually present and discuss the entire surgical procedure with the patient, they are also able to plan and prep for the operation—ready for all the possible complications and scenarios—with the ultimate goal of successfully completing the procedure in a shorter span of time. Such is the case for a Chinese surgical team, which successfully completed a delicate open heart surgery on a nine-month old baby who suffers from a congenital heart defect called a Total Pulmonary Venous Anomalous Drainage. 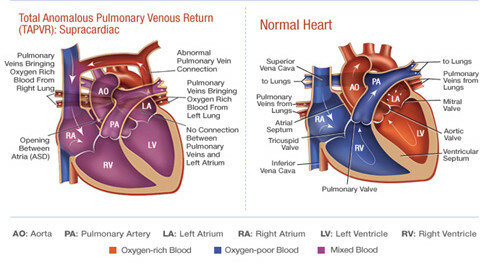 The condition, illustrated in the graphic below, is one in which every one of the four pulmonary arteries is defectively arranged. The team used a 3D-printed heart replica to start planning for the surgery to address the child’s malpositioned pulmonary veins and an atrial septal defect. This marks the first time that a full-sized, 3D-printed heart was used to pre-plan a major surgery in China. “With the model, we were able to know precisely where and how we should cut, and how big the incision should be. And with such a thorough plan, we spent only half the time we had expected to complete the surgery,” the baby’s surgeon, Doctor Zhang Xueqin said. The child, meanwhile, has already undergone the surgery and has been moved to a general recovery ward, and is expected to recover nicely with no unwanted side effects. Which bodes very well indeed for the future of using 3D materials in surgical planning.